to a time when you were still good. We're about halfway through the first round of the playoffs, and while nobody has been eliminated yet several teams are starting to emerge as clear favorites. By this time next week, eight teams will be through to the second round. Of course, that also means that eight teams are going home in the next few days. And it's not hard to figure out which ones, as long as you know the subtle signs to watch for. When a reporter asks if the star player's injury is day-to-day or season-ending, the coach replies "yes". Your team looks so small, slow and fragile that fans have been inspired to start a twitter campaign called #ThrowTheSnail. Your Canadian players are already thinking about what kind of injury to fake when Mark Messier calls about the world championships. Your fans' racist blackfaces all include little frowny mouths. The mounting pressure has left your starting goaltender so mentally unstable that he now ends every sentence with an invitation to come chat with him on spiffbox. Daniel Alfredsson just guaranteed that your team is making it to the second round. Around the team, the tension is running so high that Daniel Carcillo has already pretended to get hit in the face with it. At the end of the game, your PA guy announces "Last minute to play in this god-forsaken waste of a season... um, I mean period." Your local golf course has received reports of two weird guys in green spandex dancing next to the first tee. Mike Murphy and Ron Maclean just spent twenty minutes arguing over whether or not your team has demonstrated a distinctive choking motion. Toronto Maple Leaf fans have started describing your season as "incredibly successful". Sidney Crosby has already decided which of your players he won't be shaking hands with. Messier had me laughing out loud. I'm on spiffbox with the other celebs, come find me u wimps. Daniel Carcillo's killed me. Got I hate that guy. Yes. We're all equally surprised that you just scored. Lets be fair here. 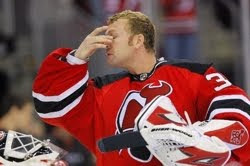 Martin Brodeur was always a fat overrated slob behind great defense and coaching. He's just being exposed now, is all. Oh man mentioning Crosby and handshakes, is going to get the touchy Penguin fans all riled up. 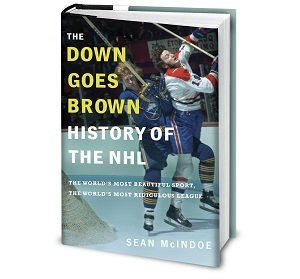 I can hear the squawking already coming from the hillies of Western PA.
"demonstrated a distinct choking motion..." that could easily be pierre mcguire and mike milbury arguing on nbc here in the states... rotflmfao!! !